Invincible Tosserz Squeaker Dog Toy. Invincible Tosserz Squeaker Dog Toy is the ultimate toy for cuddle-time play. Perfect for fetching, tossing, and chomping, contains one jumbo Invincibles squeaker ball that keeps squeaking, even if punctured. The design is based on Outward Hounds bestselling Invincibles squeakers for maximum squeaky fun. One jumbo Invincibles squeaker in these toys excites dogs as they chew & chase. Plus, strong tails for convenient, interactive fetching fun! Give your dog the joy of endless squeaks and the great mouthfeel of soft poly plush over a solid squeaker. 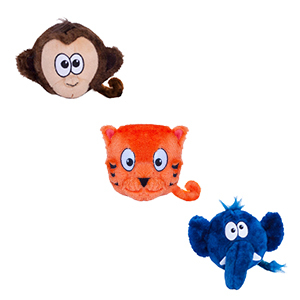 The Invincibles Tosserz Toys also features durable embroidered details, plus plush ears and a 4″ tail great for grabbing. And since this dog toy contains no stuffing, you’ll have much less mess to pick up if your dog is determined to deconstruct her toys. – Supervise your dog whenever she plays with her toys. Inspect toys periodically to ensure that your dog hasn’t chewed parts loose. Do not permit your pet to continue playing with a toy if it is broken or damaged.